Avdiyivka came under fire from 120-mm mortars. Russia-backed militants mounted 94 attacks on Ukrainian troops along the entire contact line, the press service of the antiterrorist operation (ATO) headquarters said on 11 July. "The largest number of attacks was recorded in the Donetsk sector. The enemy used banned 152-mm artillery systems to shell our strongholds in the village of Novhorodske, and 122-mm self-propelled artillery systems to fire on the village of Mykolayivka Druha. The villages of Mayorsk, Pisky, Novhorodske and Troyitske, and the town of Avdiyivka came under 120-mm mortar fire," the ATO HQ reported. Additionally, the enemy violated the cease-fire in the Mariupol sector 29 times. 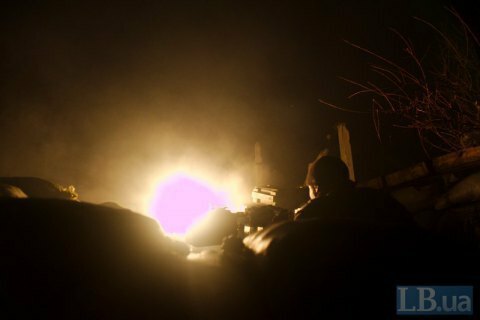 Officials noted that militants used 120-mm mortars to shell Ukrainian troops in the villages of Talakivka, Vodyane, Novohryhorivka and the town of Maryinka. They also fired 82-mm mortars on the villages of Shyrokyne and Hnutove and the towns of Krasnohorivka and Maryinka. "The Russia-backed militants fired grenade launchers, infantry fighting vehicles, large-calibre guns and small arms in Donetsk Region," the ATO HQ added. "In Luhansk Region, the enemy launched both random and aimed fire from different types of weapons 17 times. Sixteen shells were fired from the banned 122-mm artillery systems to shell our positions in the village of Novooleksandrivka, and 14 times in the village of Novozvanivka," the statement reads.